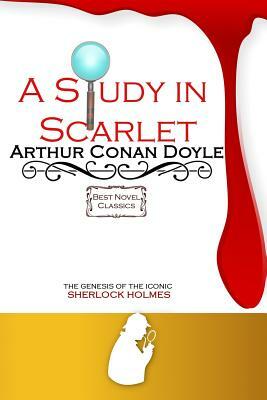 The book's title derives from a speech given by Holmes, an amateur detective, to his friend and chronicler Watson on the nature of his work, in which he describes the story's murder investigation as his "study in scarlet" "There's the scarlet thread of murder running through the colourless skein of life, and our duty is to unravel it, and isolate it, and expose every inch of it." The story begins in 1881, when Dr. Watson, having returned to London from Afghanistan, runs into an old friend Stamford at the Criterion Restaurant, who had been a dresser under him at St. Bartholomew's Hospital . Watson confides in Stamford that, due to a shoulder injury that he sustained in the Anglo-Afghan War at the Battle of Maiwand, he has been forced to leave the armed services and is now looking for a place to live. Stamford mentions that an acquaintance of his, Sherlock Holmes, is looking for someone to split the rent at a flat at 221B Baker Street, but he cautions Watson about Holmes's eccentricities. Then they get settled into 221B Baker Street, Holmes starts shredding on his violin, and the British bobbies coming to consult him about the strange case of the gentleman what died of unknown causes, which they find to be "too many" for them. Holmes does a lot of his patented scrutinizing, crawling, sniffing, tasting thing, to the astonishment of everybody, but none more so than Watson who is an instant fanboy. Not long after, just when Holmes is about to collar the guilty party, the book goes to Part 2 and something happens which would have flummoxed even Holmes himself if he wasn't confined inside the narrative. Basically, in "Part II: The Country of the Saints" Holmes and Watson completely disappear from the book, and the narrative shifts to the backstory of the murderer who is kind of a good bloke, multiple homicides notwithstanding. Today 'Sherlock Holmes' is a household name and it all started from this book.